This is hands down one of my favorite projects we've ever done. So simple, so ethereal and magical. You can order one online for a pretty penny, or opt the DIY route, customize to your liking and create it for a fraction of the cost. As to the actual frame, no need to reinvent the wheel. Click here or here for directions. I'll just tell you what we did differently. I didn't sew anything. I used a sheer Ikea curtain, slid one base rod thru the pocket end, draped it over the top and tucked it tightly around the opposite base rod. Yep. I'm all about following directions. ;-) You could also use stitch witchery or something similar to avoid sewing. Someday I'll give her more privacy with real fabric, but toddlerhood is no time to test that one out. For now, sheer is perfect. She feels hidden but I can still see whatever she's up to. 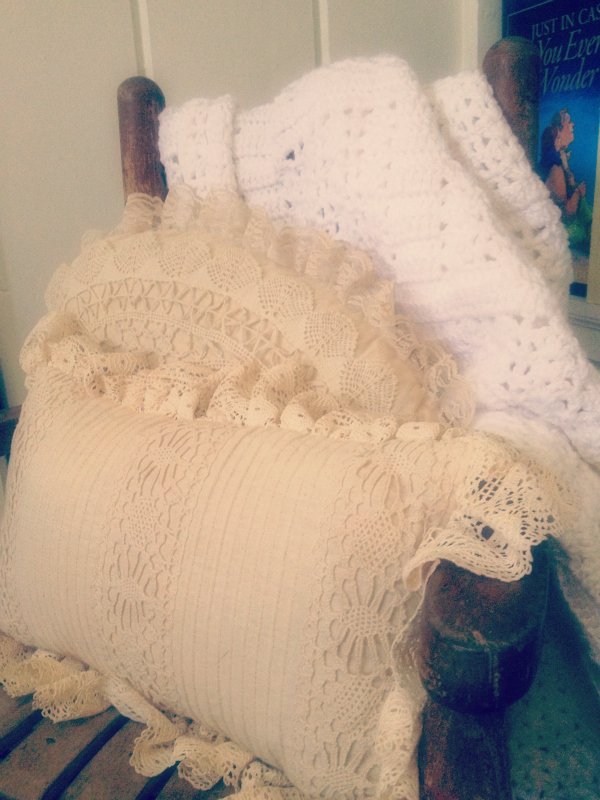 A quick trip to the thrift store turned up a flowery vintage bed sheet with a ruffle along one side, perfect for the 'floor', and pair of lacy valance curtains wound around the front rods created a sweet entry. A few fluffy pillows for lounging were also necessities. I hung pretty doily ornaments from an estate sale and a string of shimmering twinkle lights inside to give it a magical glow, especially in the evenings. 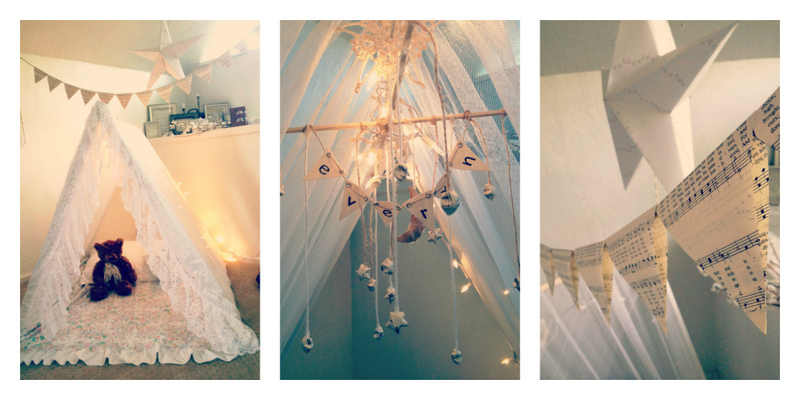 And my 17 year old little sister-in-law made the most adorable 'chandelier' to hang for Ev's first birthday. I can't even talk about how it made me feel. Or the note that went with it. I just, omg. I fell apart. Like over and over. I might be falling apart again just thinking about it. So there you have it! A few bucks at the hardware and thrift store, a few drilled holes... and done. Years upon years of magic and make believe and cuddles and reading. Can. Not. Beat it. In a perfect world I would have had the to-die-for tent from the movie The Holiday, but this turned out to be perfect for our space. And secondly, the reading corner. If it's possible, this one is even easier. It's positioned directly across from her tent in a small bonus space just off our master. It was intended to be a kind of sitting area, but works perfectly as a tiny changing/dressing/play space. We are literature crazy in this house. Reading, collecting vintage and antique books, crafting with them, studying them, using them as decor, you name it! pick out any type of moulding you like from the hardware store. Just make sure it's thick enough to create a 'shelf' for the books to rest on. Ours is about 2 inches deep and works perfectly. Pre-measure your space so you can have them simply cut it to size at the store. use a few screws to hold it in place. Be sure to use a level to make sure they're straight. a little putty over the screws to hide them. Once dry, a simple coat of paint, and there you have it! I mean, seriously. It's that simple. Turned out to be the perfect spot for the little antique rocker which belonged to my dad. My sister and I both grew up in it, as well. I couldn't have been more thrilled when my mom passed it down to Ev. I've wrestled with painting it. (Creamy white. Because hello, I paint everything white.) Still undecided. At the moment it still boasts its original, although worn, finish.